Stunning Keisha: Do You Remember? Hola kitties! How's your memory? I'll bet it's better than my peeps. I think they're #senile. Remember when I used to do #Senile Saturday posts? Another great feature than petered out cos TW let it. Maybe it had something to do with that photo I posted of little girl her draining a beer bottle. Walking through the aisles and browsing the records in this record store brought back such memories. OK, so they weren't exactly MY memories but TW's. She doesn't remember much but does have happy memories of times spent in her friends' record shops down in the Village—Greenwich Village, that is. I think she's forgotten more about music than a lot of people will ever know. I'm joining the Music Moves Me blog hop hosted by Curious as a Cathy and XMas Dolly and a chorus of others. 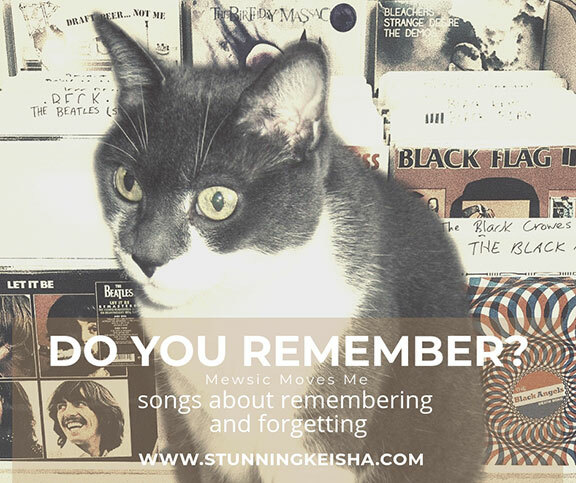 The theme this week is songs about remembering or forgetting. The words didn't have to be in the song title but like I told you, TW is #senile and can't remember the words to all the songs. She wasted a bunch of my time listening to songs which she thought might mention forgetting. They didn't. She knew two songs that did have "forget" in the title but thought they were too wimpy. This first song is one of her all-time favorite songs so it came to mind right away. She's so old, she remembers everything mentioned in the song. We think everyone her age used to crawl under the covers so they could listen to their little tinny transistor radio all night. TW found herself humming a song and it came to her that she could use it today. Ironically, we wanted to use Athens, GA's Chickasaw Mudd Puppies last time but they didn't have songs that began with the right letters. They might be the only band ever who performed while sitting in rocking chairs. TW won't like me telling you this but she almost threw out her back dancing in her chair to this tune. I'm not exactly sure if this fits in the "forget" theme but it does contain the line "it beats pickin' cotton and waitin' to be forgotten." Plus, it's a great song by a great band from Minneapolis and the video is pawsome. Thanks to all my new music-loving fans who stop by to see me and listen to what DJCK is playing every week. I kinda miss my weekly gigs so I really enjoyed spinning tunes at the Chilipawty. That's all the musical entertainment for today. I'm sure our inconsiderate neighbor will be "entertaining" us all week again. Some stroke of inconsiderate genius told them it was OK to hang their Dolby surround sound speakers on our common wall. When they play their entertainment center, which is pretty much 24/7, it vibrates the walls. All TW hears is the bass sounds and the drums and it reminds her of Chinese water torture. We are not amused—or entertained. Mom's never heard any of those songs, or those groups. I'm sorry about your neighbor's music. Our suburban back-yard neighbors are also very loud with their music and it annoys the sanity of out Mom. 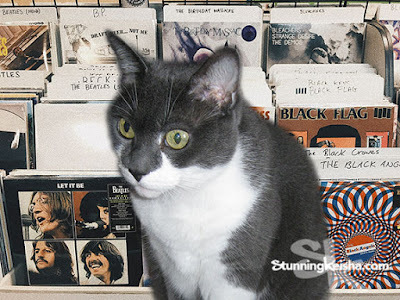 My human loves the Replacements and the Ramones! We do like most tunes too CK even if the Dad can't remember which ones MOL! I think I remember the rock & roll radio somewhere in the cobwebs of my memory, but then again I don't remember a lot of things these days, but the others thanks for the introduction. You definitely ROCKED THE HOUSE! Thanks for playing along with us. Ugh, we would hate it if our neighbors played loud music like that! I've had a long history of neighbors and their crappy loud music too. Maybe if they'd play some country I wouldn't mind so much! I don't remember these songs . . . but then again, forgetting is part of the theme, too. We don’t know any of these songs...so we don’t have to worry about forgetting them. I hope your neighbor would be more considerate about playing music. I hope those neighbors keep it down this weekend! Or at least maybe they'll play some good music for you. What a great set of songs here! I almost used the Ramones one. I'm not at all familiar with the Chickasaw Mud Puppies...that's a fantastic name! And never heard of the Replacements before either. Good songs, all. That's so cool to find new tunes.